Are you ready for travelling? I know that the answer is a big "YES!" but also remember that it would be an educative trip so there will be some classwork to do...Ups! Download and print this document and bring it with you to Atapuerca next Tuesday. Remember to take a notebook and a pen, too. We will take your answers at the end of the journey. 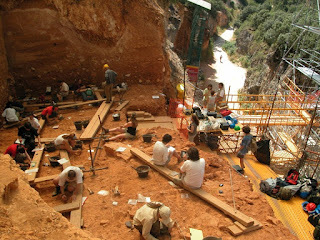 Meanwhile, you can have a look to the websites of Atapuerca and MEH (Museo de la Evolución Humana).